I just had the pleasure of frolicking in the sun and sand on the glorious beaches of the gulf coast of Florida. During my stay I encountered a lovely little citrus tree with some enormous yellow fruit dangling from its branches. 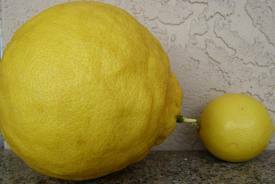 Yep, that’s a normal sized lemon, found in your grocery, next to a Ponderosa Lemon, also nicknamed The ‘Five Pound Lemon’! 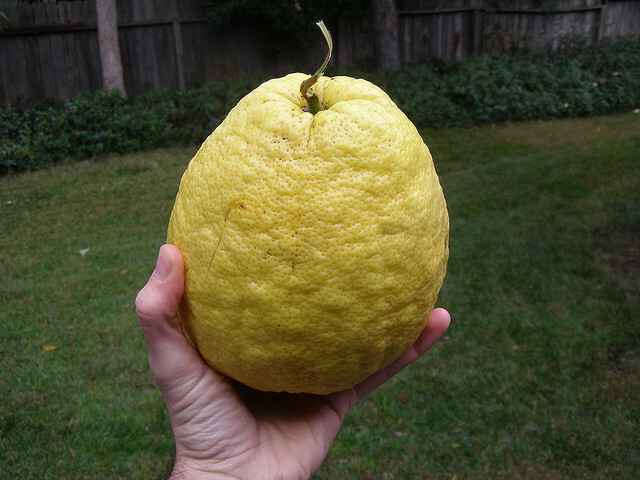 The fruit is bumpy skinned and weighs 2-4 pounds but can reach the size of a football! The flavor is excellent and because of its size is terrific for juicing and cooking. Can you imagine a lemon garnish on your next martini from this bad boy?? So, next time life gives you (Ponderosa) lemons, make (a gallon) of lemonade! 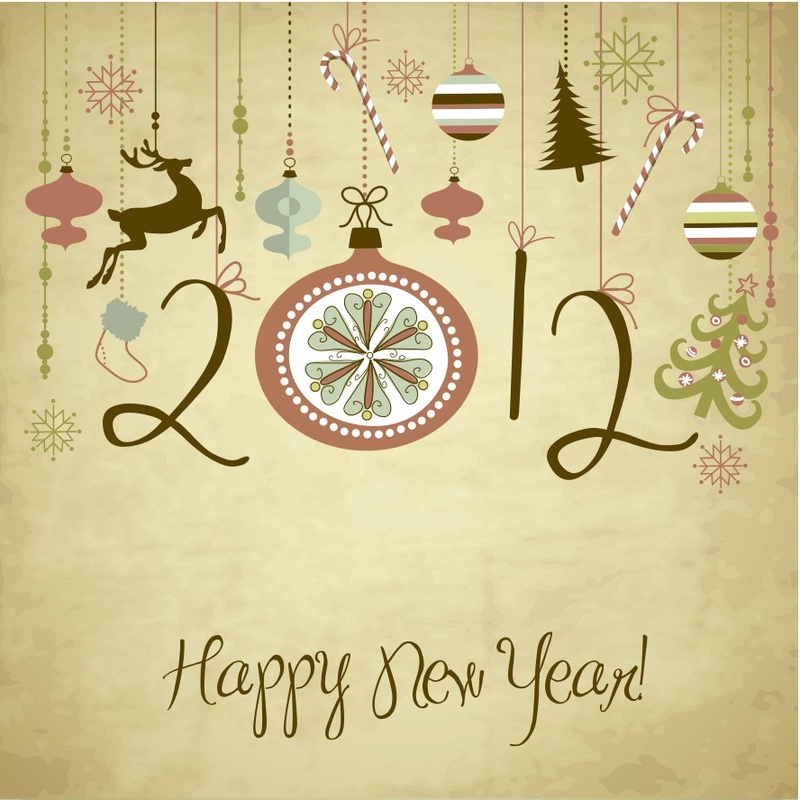 May Your 2012 Be Filled With Many Delicious Blessings! Have you missed us? We’ve been working on some exciting new things…yep, one of which is our new site! Ta-da! You like?? Just in time for Christmas, thanks Santa! Also in time for Christmas I bring to you…(Little Drummer Boy drum roll please) BUCKEYES! Thanks to my friend Penny, these peanut-butter-chocolately nuggets are definitely a holiday tradition at our house and guaranteed to be in yours too! Mix the peanut butter, sugar and butter together well with a mixer. By hand, gently mix in the cereal. With buttered hands, roll 1 tsp of the peanut butter mixture into half-dollar sized balls and place on a parchment paper lined baking sheet. (You may have to cool the mixture in the frig if it gets too soft/warm to ball.) Place sheet of balls in frig to keep cool until chocolate is ready for dipping. 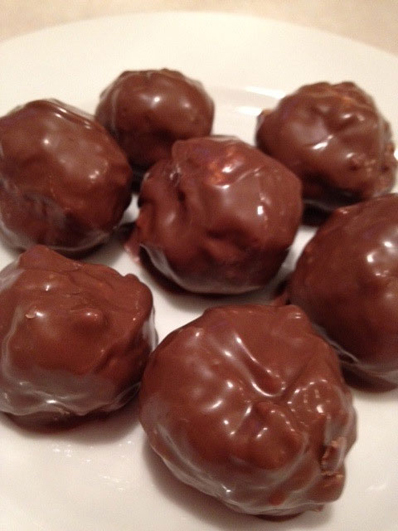 Once melted, dip each ball into the chocolate to coat evenly. With a fork remove the coated ball and let excess chocolate drip off and place back on the baking sheet to harden. Let me tell you, these babies are heaven! I usually make 6 times this recipe and give as gifts during the holidays. 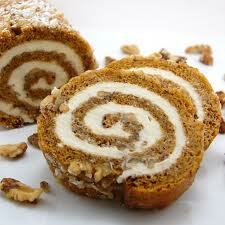 Pumpkin Cake – that’s how we roll! This fall has been a flurry of pumpkin recipes for me and other pumpkin-lover peeps out there, so why stop now? After all, Thanksgiving just wouldn’t be Thanksgiving without a good showing of that veggie with the lovely orange hue! Preheat oven to 375 degrees. Beat eggs on high-speed for 5 minutes. Gradually beat in sugar. Stir in pumpkin and lemon juice. In a separate bowl, stir together dry ingredients and fold into pumpkin mixture. Spread onto a WELL greased and floured 15 x 10 x 1 pan. Before baking top with chopped walnuts. Bake for 15 minutes. While still hot, turn onto kitchen towel sprinkled with powdered sugar. Start at narrow end and roll towel and cake together. Cool completely and unroll. Beat all filling ingredients until smooth. Spread over cake and re-roll. Chill until serving. ~ Kudos to Sweet Peas Kitchen for the photo! 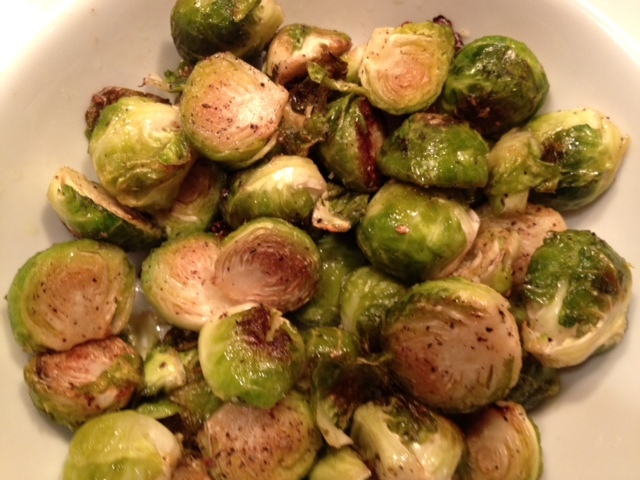 Side of Sprouts this Thanksgiving…yep, I’m talkin’ Brussels Sprouts! We were one of those weird families where all of us kids LOVED veggies…I mean ALL veggies! We’d devour even the ones that the rest of the kids in the world would wrinkle up their noses and make those gagging sounds – yeah, you know the ones. Yep spinach, asparagus, cauliflower and even those strange mini-cabbage looking things called brussels sprouts! Preheat oven to 400 degrees. Cut off the ends of the sprouts and peel off any browned or yellowed leaves. Cut each sprout in half. Place them in a bowl and add the olive oil, salt and pepper, mix to coat. Pour the sprouts onto a baking sheet covered in aluminum foil and roast for 25 minutes, shaking and turning the sprouts occasionally to brown evenly. Drizzle a little more oil if looking too dry. When tender, remove from oven and sprinkle again lightly with salt and serve. Looking for that “stick to your ribs”, warm and cozy dinner that leaves you pleasantly satisfied…oh yeah, and it’s got to be simple? Here you go, Crock Pot to the rescue! Empty the soup and the chicken broth into the crock pot, whisk to combine. Add the chicken, make sure there is enough liquid to completely cover chicken. Add all the veggies and the seasonings. Cook on high for 6 hours. After 3 hours of cooking, add the biscuit pieces (push down under liquid to make sure tops cook) and continue cooking for the remaining 3 hours. 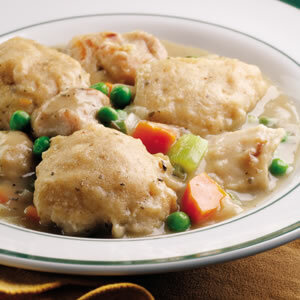 Before serving, remove whole breasts and cut up into chunks…they should just about be “fall apart” tender, and put back in pot. Tip: At the end of cooking time, if mixture has too much liquid, add a little bit of flour, mixed in thoroughly and it will thicken up. 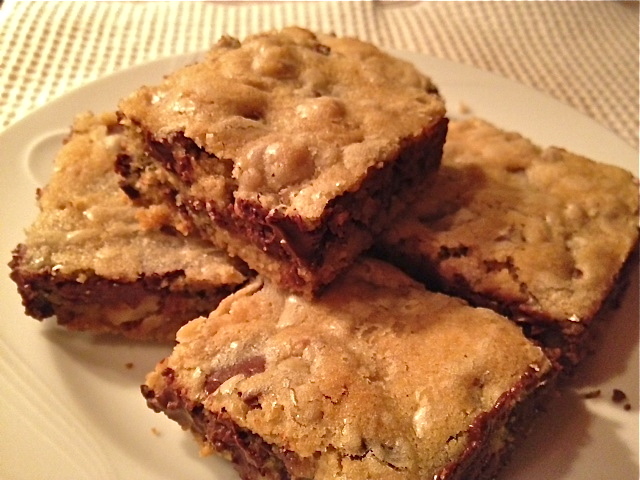 These Blondies, with LOTS of chocolate chunks (due to my addiction), are scrumptious! I’m also quite fond of walnuts, feel free to omit but you’re gonna miss the added nutty crunch…I’m just sayin’. Go ahead, make these this week and be a hero in your office, to your kiddos or make them just for you. You deserve it! 2 sticks of unsalted butter, at room temp. 1 1/2 pounds of chocolate chunks, such as Nestle’s or better yet, Ghiradelli’s!! Preheat oven to 350 degrees. Flour and grease a 9×13 baking pan. With an electric mixer, cream the butter and sugars on high for about 3 minutes, until light and fluffy. On low speed now add the vanilla and eggs one at a time. In a small bowl, mix the flour, baking soda and salt. Still on low speed, slowly add the dry ingredients to the wet ingredients until combined. With a spatula, fold in the walnuts and the chocolate. Spread the batter in the prepared pan and bake for 30 minutes, do NOT over bake. The blondies will seem slightly undercooked when you test with a toothpick, but that’s what you’re looking for! Cool completely and cut into bars. Y-U-M!! Perfect for a chilly fall weekend (with or without snow), these hearty delicious gems will start your day with a smile! Your tummy will thank you. In a large bowl, mix together the milk, pumpkin, egg, oil and vinegar. In a smaller bowl, mix the flour, sugar, baking powder, baking soda, salt and remaining spices and pecans. Mix dry ingredients into pumpkin mixture, just until combined…don’t want to over mix and have touch cakes now! 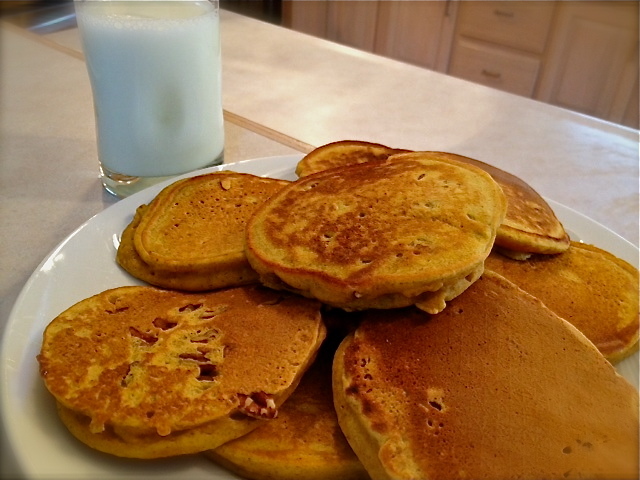 Lightly oil a heated griddle (medium heat) and add batter by 1/4 cup fulls. When cakes are bubbled on top and browned on the bottom flip. When both sides are golden brown, serve. 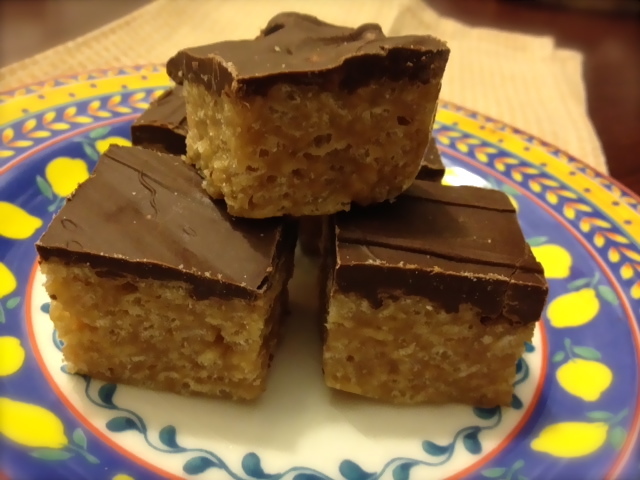 Two of my all-time favorite sweet treats are Reese’s Peanut Butter Cups and Rice Krispy Treats. Which one shall I eat?? Well, hallelujah – I no longer have to choose! These super easy, super rich and delicious goodies will please any sweet tooth, promise. Mix sugar, corn syrup and peanut butter on low heat. Bring to a boil, being careful to not burn! Remove from heat and add rice krispies. Press in greased 9×13 pan. Melt chocolate and butterscotch chips in microwave, stirring every 20 seconds. Spread melted chips on top of treats in pan, refrigerate until set. Grab a BIG glass of milk and enjoy!